For decades, Lely Golf Estates has been a quiet, comfortable neighborhood. But, longtime homeowner Gerald Cusak said he and his neighbors are on edge. “The neighborhood now, everybody is in jeopardy,” Cusak said. 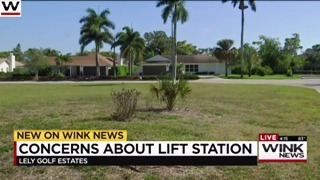 Homeowners are worried Collier County will build a sewage lift station on a neighborhood lot within 130 yards of 204 residences in Lely Golf Estates, which may make the air stink while possibly lowering their properties values. Dr. Lisa McGarity, the Homeowners Association president, is leading the fight against the Collier County commissioners. “Sewer gases, multi-ton trucks, all of a sudden would be invading our neighborhoods and of course our quality of life would decimate,” McGarity said. McGarity said some homeowners have put out for sale signs as they fear for what a sewage lift station would do to their property values and the air they breathe. After a hearing at the commissioners meeting Tuesday where McGarity spoke, the board decided to review the plan and hold a public hearing in the future. An independent realtor told WINK News that homes valued currently in the $250,000 to $550,000 range could immediately drop in value by more than 15 percent.